Our full service fossil store is located in the heart of the Dinosaur Capital of the World - Drumheller Alberta across the street from the World's Largest Dinosaur. 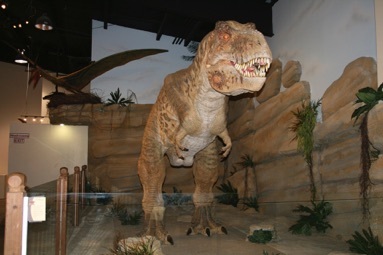 Looking for the Fossil World Dinosaur Discovery Centre Museum Website? Dinosaur and Town of Drumheller Spray Park. 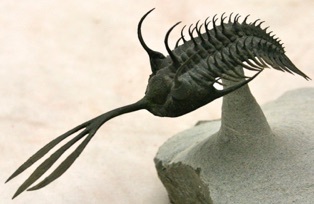 We sell fossils, minerals, t-shirts, dinosaur toys, dinosaur books and souvenirs. We also operate an ice cream store. We are a customer friendly operation that has been in business in Drumheller since 1999. We are both service and education oriented. One of the reasons to do business at a fossil store is we are going to be there year after year and if there is ever any problem with something you bought we can fix it or deal with. The best time to come and look for something special is in late April or early May. We typically will have all our new fossil inventory out by that time. Each year we have a number of fossils on sale, these are typically what we were able to get a good buy on last year due to a bumper crop of those fossils or minerals coming to market. We always have great prices on souvenir t-shirts with dinosaurs and Drumheller, Alberta imprinted on the t-shirt. We have a large variety of real fossil digs and dinosaur skeleton digs on hand. Kids love to dig discover and learn. Located just 2 km away from the Fossil World Jurassic Store on North Dinosaur Trail on the way to the Royal Tyrrell Museum but still in the town of Drumheller. 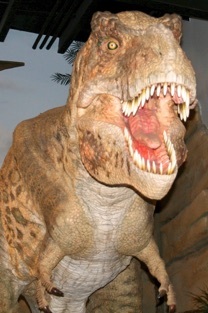 A natural history museum with hands on dinosaur fun for the family. Megalodon Jaw with 5 rows of teeth (9ft x 7ft). Dig Discover Learn - Fossil Dig, dig up one of three dinosaur skeletons and take home a real fossil, mineral mining station where you mine for minerals and get to take home a vial (great family fun together), fossil climbing wall. Fossil Climbing Wall - This wall is 24.5 ft high and uses an auto belay safety system. Minimum weight is 35 lbs. This is a great family event. Our goal is to empower each user to do their best and have fund doing it. Mineral Mining - Kids get to mine for minerals and fill up a vial with the minerals they find. A great family bonding time and a chance for dad to get in there and help the young ones select their own mineral specimens. Discovery Pass - lets you do all three activities and includes museum admission. It basically gives you your third activity for free. This is a very popular choice especially among returning visitors. World Class Real Fossils in keeping with the standards of the Royal Tyrrell Museum our real fossil exhibits are also work class, but unique to what is offered at the Royal Tyrrell Museum. Exhibits including a trilobite collection, dinosaur skulls, dinosaur egg collection, T.Rex bones, dinosaur teeth, Megalodon and other shark teeth, Alberta ammonites with ammolite, dinosaur claws, dinosaur coprolite, dinosaur footprints, meteorites, 10 ft wholly mammoth tusk and more. Our museum store features real fossils for sale. The store is a dinosaur museum in itself with several cool dinosaur models including Velociraptor, a 9' baby T. Rex and a flying Pterosaur. Also featuring dinosaur toys, dinosaur t-shirts, dinosaur souvenirs, unique minerals, fossil jewelry and much more. Across the street from the World's Largest Dinosaur in Drumheller Alberta. 1381 North Dinosaur Trail in Drumheller, Alberta. To see a map of our locations click here!